1. You are designing a routing solution for your organization. You want to improve routing efficiency by ensuring that routers save frequently used data link headers to encapsulate packets. 2. Which Cisco express forwarding mechanism maintains layer 2 information linked to a particular entry in the routing table, reducing the need to send ARP requests before forwarding packets? 3. What is the default administrative distance for OSPF? 4. Which of the following symptoms indicate a layer 2 problem with the Serial0/1/1 interface? Interface status shows Serial0/1/1 is up, line protocol is up, but ping fails. Interface status shows Serial0/1/1 is administratively down, line protocol is down. Interface status shows Serial0/1/1 is up, line protocol is down. Interface status shows Serial0/1/1 is down, line protocol is down. Interface status shows Serial0/1/1 is up, line protocol is up, ping succeeds, but a Telnet connection can't be established. 5. Which of the following symptoms indicate a layer 1 problem with the Serial0/1/1 interface? What should be your first step in troubleshooting the problem? Verify that the encapsulation is correctly configured. Check the cable connector on the router. See if you can ping the remote router. Verify that the remote router has an IP address set. See if you can establish a Telnet session with the remote router. You ping the remote router but that fails as well. At which layer of the OSI model does the problem originate? A loop exists between two of the routers. 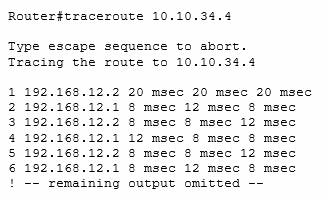 The routing table is missing a static route to 10.10.34.4. The device with the address 10.10.34.4 is in the wrong subnet. The interface on the local router is administratively down. Configure an address of a DNS server for the router to contact. Create a static route to the Sales5 router. Modify the access list on Sales5 to allow Telnet traffic. Enable ARP broadcast support on the router.